At the start of a new year, many of us set goals for the coming year. We also use this time to reflect on the year that just finished. We may even find ourselves suddenly motivated on the 1st of January to learn a language, take up a musical instrument, or get back into an exercise regime. Perhaps updating a space in your home tops your list of dream projects for the year, and you would like to turn that goal into a reality? For us, the new year is the ideal time to reflect on our favorite designs from 2017. This allows us to remember the homes and families we impacted last year, but also offers inspiration for new designs in the coming year. Here are our top 5 designs from 2017. Let us know which one is your favorite! You never know, our favorites from 2017 may inspire you to realize your ideal home living space by kicking off a remodeling project. Bathroom designs are about more than creating space to brush your teeth and shower. We start and end the day in the bathroom, and so should find motivation and relaxation in a well-organized space. This bathroom remodel incorporated existing fixtures with new features such as skylights and a new window in the shower. The combination of natural light, a large frameless bathroom mirror, and glass shower panel make this space light and airy. Matching mosaic tile details on a wall and the tub reflect light and add visual interest to the design. 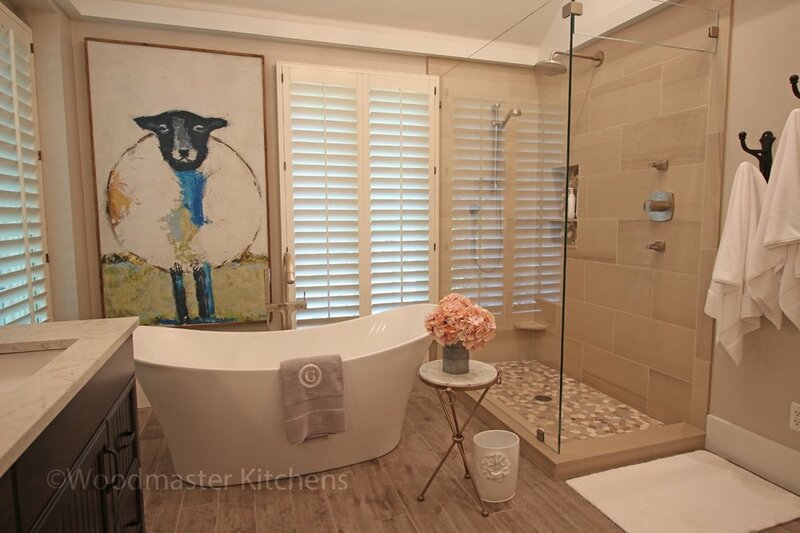 Between the elegant freestanding tub, the large open shower, and underfloor heating, this master bath design is the ideal place to unwind in a soothing atmosphere. The frameless glass shower enclosure is equipped with both handheld and rainfall showerheads and cobblestone flooring, giving the space the ultimate in-home spa feel. Dark wood vanity cabinets with a central tower cabinet for extra storage add to the warm feel of this bath design. Did you spend 2017 trying to find that perfect pair of jeans at the back of your closet, or tripping over shoes due to your lack of purpose built storage? Make 2018 the year that you upgrade your closet to meet all your clothing storage requirements. A bathroom remodel is the perfect time to get your closet done, as the two are typically in the same area of the house. This closet remodel included a combination of hanging storage, open shelves, and drawers. With the popularity of contemporary and transitional style designs on the rise, this traditional kitchen design stands out. The dark wood kitchen cabinets and Typhoon Bordeaux granite countertop offer a warm appeal, and are highlighted by a multi-layered lighting scheme including undercabinet lights. A 30” Chef’s stainless-steel sink from MR Direct is the perfect complement to a busy family kitchen. This is the ultimate open plan kitchen design geared toward an active household. The large kitchen island equipped with a Galley Workstation and cooktop is perfect for preparing food while entertaining guests. It includes ample barstool seating, and a television built into the side of the island that faces onto a living area. 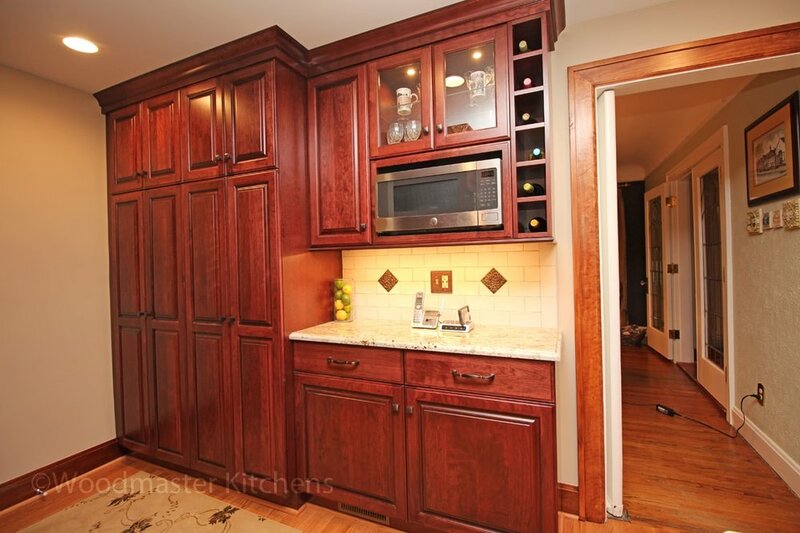 The perimeter cabinetry includes a beverage bar with glass storage and undercounter refrigerator. If updating a space in your home is one of your goals for 2018, let our top designs of 2017 offer ideas. Contact us today on 586-778-4430 to get started on your home remodeling project, or drop by our showroom to talk to us about your requirements. We can’t wait to hear from you!